A futuristic wind powered cargo ship is in the works, and it sports sails modeled after one of the largest luxury yachts in the world, the Maltese Falcon. If it proves successful, the new B9 cargo ship could usher in a new era of fossil fuel–free technology at a critical time for the shipping industry, which is facing the prospect of soaring greenhouse gas emissions as the global import-export market trends upwards. The B9 is the brainchild of Ireland-based B9 Shipping, part of the B9 Energy group. The rigid sail design actually predates the Maltese Falcon; called Dyna-rig, the foundational technology dates back to the 1960’s. The advantages of Dyna-rig over canvas sail are numerous. Aside from durability, the electronically operated system requires no rigging lines or hand operation, and it responds quickly to changing wind conditions. B9 Shipping notes that the Maltese Falcon has crossed the Atlantic twice and has achieved a top speed of 24.9 knots using a Dyna-rig system. B9 Shipping also notes that the Maltese Falcon only uses its sails about 61 percent of the time. The yacht’s auxiliary power is provided by biogas, and that’s where the B9 Energy group will come in. B9 plans to manufacture biogas for the cargo ship primarily from a food waste stream, which will power an “off-the-shelf” Bergen gas engine from Rolls Royce. The University of Southampton’s Wolfson Unit for Marine Technology and Industrial Aerodynamics will be conducting a detailed series of studies as work on the new ship progresses, including economic feasibility as well as performance studies on various hull shapes. The final design will also take into account the work flow of the shipping industry — namely, loading and unloading cargo. However, if B9 wants to produce the world’s first fleet of commercially viable wind powered cargo ships, it better get a move on. 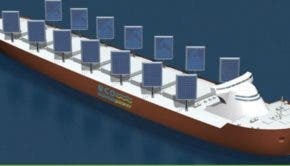 Last year a company called Eco Marine Power unveiled a rigid sail design for cargo ships that incorporates solar panels, and just last month the University of Tokyo proposed a design for cargo ships powered with low cost metal sails.